The House Education Committee went against overwhelming public opinion Wednesday by voting to remove several references to global warming and fossil fuels from a proposed slate of new science standards. Committee members voted 12-4 to approve K-12 science standards after first removing one standard referencing fossil fuels and global warming and then pulling out all supporting content. The committee voted to take the standards apart despite two days of public hearings last week where all 28 people who spoke urged the passage of full standards with climate change references left intact. During six public hearings in 2017, only five of the 1,000 people who left feedback opposed the proposed standards. The remaining 995 people supported the full standards, State Department of Education officials said. The supporting content appears on most pages of the 75-page standards document. Taken together, the supporting content that was removed would fill more than a dozen pages. In that regard, House Education went further than last year in its effort to remove references to climate change and global warming. Last year, legislators approved temporary new standards after first removing five sections that reference global warming and human impact on the environment. Caldwell Republican Rep. Scott Syme led the charge to remove references to climate change in both years. Syme, who several legislators jokingly refer to as “Scott Syme the Science Guy,” said his problem with the standards and supporting content was that the language pushes students toward certain conclusions. Last week, Syme told a reporter with the Spokesman-Review that he did not care if students come to the conclusion the Earth is flat, so long as that was the student’s own conclusion. Syme spoke only briefly to an Idaho Education News reporter after Wednesday’s vote. He reiterated that he supports inquiry-based standards, and then walked away while being asked followup questions. Boise Republican Rep. Patrick McDonald joined all three committee Democrats in opposing the move to remove the standard and supporting content. McDonald, the committee’s vice chairman, said he wanted to support the local teachers who developed the standards. Earlier in Wednesday’s meeting, Garden City Democratic Rep. John McCrostie made an unsuccessful push to approve the full standards. McCrostie, a teacher himself, lacked the votes to approve the full standards, while Syme had more than enough votes to pull out references to climate change. 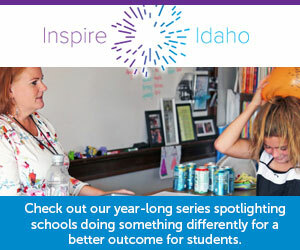 A different committee comprising 20 of Idaho’s most-awarded science teachers worked alongside university officials and industry representatives from Idaho National Laboratory to develop science standards over each of the past three years. State Department of Education officials estimated that the committee of teachers collectively put in more than 1,000 hours of work into the research, drafting, review and presentation of the standards at a series of public hearings. The House Education Committee doesn’t get the last word — the Senate Education Committee must also consider the standards. Senate Education will have the option to approve the full slate of standards, concur with House Education’s Wednesday action or reject the standards outright. Because of the way the administrative rules process works, a Senate Education vote to approve the full standards would be enough to approve them for use in Idaho’s public schools and charters. On the other hand, if Senate Education agrees with House Education, that one standard and all supporting content will be permanently removed from Idaho science standards. State Superintendent of Public Instruction Sherri Ybarra described standards as an academic baseline for what students are expected to know and do. Local schools may go beyond the state standards, and local school districts continue to be allowed to set their own curriculum. The state needs to align its science test to the new statewide standards, finally approved by the 2018 Legislature. Saying evolution is not fully proven science, Arizona’s state schools superintendent supports changing language in academic standards. The Senate Education Committee’s 6-3 vote brings an end to a three-year debate — and leaves references to climate change intact. A Senate Education Committee hearing focused on the finer details of the controversial standards — and especially the language the House Education Committee deleted a week ago. Senators are likely to vote next week. The Senate committee will take testimony Wednesday, but won’t vote. Earlier this month, every speaker at House Education Committee hearings urged lawmakers to approve the academic standards in full.